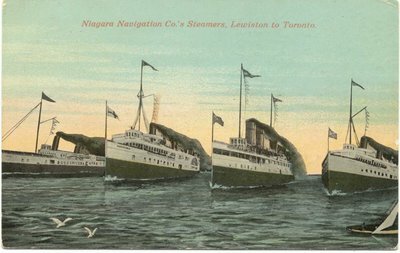 The Niagara Navigation company was the proud operator of a busy fleet of steamboats between Toronto and ports on the lower Niagara River before World War I. 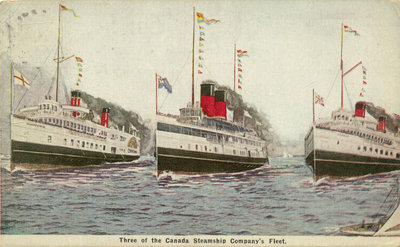 Here we have, from left to right, the CHICORA, (built 1864 and the original member of the fleet in 1878), CHIPPEWA (1893), CAYUGA (1906) and CORONA (1896). Ten years later, the company had been sold to Canada Steamship Lines (CSL) and the CHICORA retired. The colours have been updated, and the evidence of CHICORA removed.